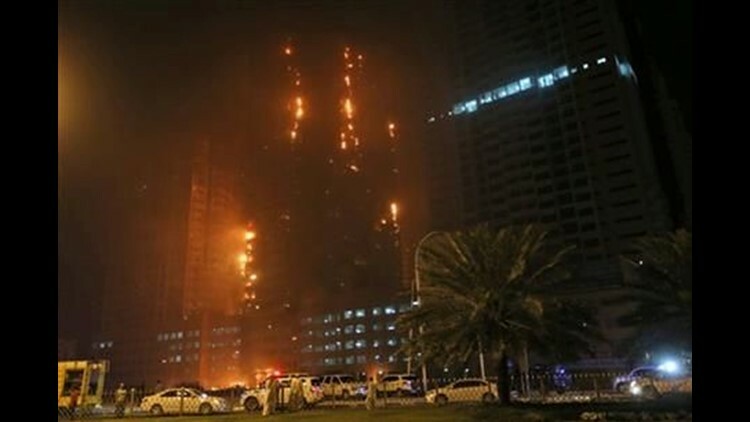 DUBAI, United Arab Emirates (AP) — A fire raced up a high-rise tower in the United Arab Emirates city of Ajman late Monday, the latest in a series of skyscraper blazes in the Gulf nation that is home to the world's tallest building. Ajman is home to many commuters who work in the Gulf commercial hub of Dubai, further to the south. Like Dubai, it is one of the seven emirates that make up the UAE federation. The Dubai-based Gulf News newspaper quoted Ajman Civil Defense director Brig. Saleh Saeed al-Matroushi as saying firefighters were at the scene working to put out the fire. A civil defense official reached by The Asscoiated Press confirmed that firefighting efforts were ongoing late into the night but had no further details. Similar fires have struck other high-rises built since the turn of this century in Dubai and Sharjah, which sits between Dubai and Ajman.